I shared a simple burrito recipe yesterday (check my Chicken-Raisin Burrito). 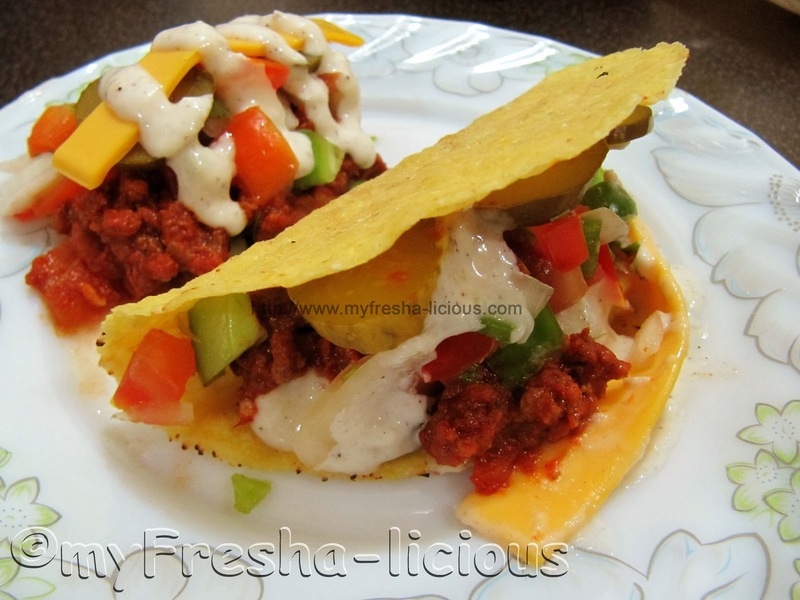 Now, let me share a taco recipe I've made months ago. I call it Spicy beef tacos. In my last post, I defined what a burrito is, now, I feel obliged to do the same with tacos. Let's get started then before I change my mind and forget to press the publish button later on. What is a taco? Taco is also a Mexican dish composing of a fried wheat or corn tortilla that is folded in half or two and is filled generally with anything you want. What is the difference between a burrito and a taco? Burritos use larger tortilla, thus, making it bigger than tacos. And thus, burritos are considered as a full meal while tacos are considered as a light meal or just a snack or appetizer. Tacos usually, is only composed of one filling garnished with a salsa and drizzled with a sauce. Burritos, on the other hand, may contain a complete meal consisting of rice, beans, and meat slash fish slash seafood OR it may contain one filling garnished with salsa and drizzled with a sauce but the amount is more than that found in a taco. One other difference is that corn tortillas are only used in tacos, and not on burritos, as they crack easily. Beef, minced - 300 g.
1. Place garlic, chili flakes, and oil in a pan and saute until aromatic. Add in the beef and stir-fry until it changes in color (about 5 minutes). Toss in the onions and corriander leaves and give a quick stir. 3. Pour the tomato paste and the rest of the ingredients. Add more water as needed. Simmer for another 10 minutes. 4. Adjust taste as needed. Simmer until most of the liquids have evaporated but do not allow it to dry out.